Noontime show Eat Bulaga! 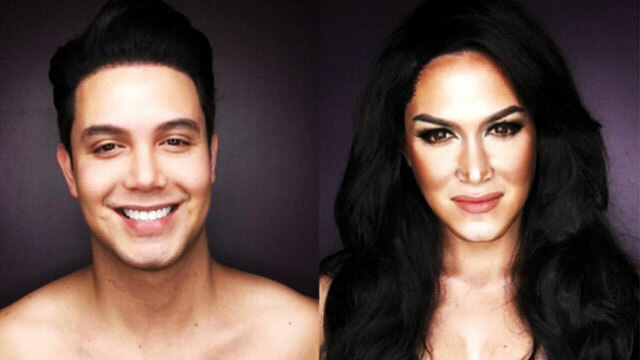 host Paolo Ballesteros does it again as he transforms into none other than Miss Universe 2015 Pia Alonzo Wurtzbach in his latest makeup transformation. Paolo posted his completed imitation of the Filipina-German beauty queen on his Instagram account on Wednesday which has already gathered 27.8k likes and 749 shares as of posting time. Just last week, he also did a makeup transformation of Miss Colombia Ariadna Gutierrez who was wrongly announced as the winner of the prestigious pageant by host Steve Harvey. The "Kalyeserye" mainstay has gained a global reputation for magically morphing into other celebrities through his makeup transformations. Among the celebrities he featured were Beyoncé, Miley Cyrus, Ariana Grande, Rihanna, Katy Perry and Kim Kardashian to name a few.